When your team tracks their exact time with Hubstaff, you can rest assured that you will only be paying for time spent working. You'll see screenshots and activity levels, and with automatic payroll they can be automatically paid through Payoneer. Your team will be more productive and you won't have to worry about manual timesheets or payments. You can set each team member to be paid on different pay periods, pay them by hourly rate, or pay them a fixed amount. You can even pay them them manually if you prefer. 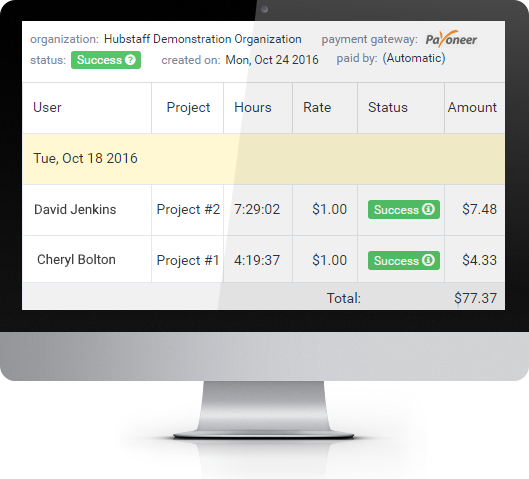 Once your team members are added and track their time with Hubstaff, automatic Payoneer payments will go out at the pay periods you specified. That's all there is to it. Whenever a payment is made through Hubstaff, a report is generated detailing the team members that worked and how much they were paid. You will always have records of time worked and paid, and you can also print or export the reports for external use. Hubstaff allows you to see what your team is working on when they are tracking time. Up to three screenshots can be taken every ten minutes. The app and URL tracking will allow you to see the different programs your team members use and the websites they visit when they are working so you know exactly how they spend their time. If your team stops working or leaves the timer running accidentally, Hubstaff will stop tracking time. Hubstaff tracks time when your team is working - it doesn't assume they were working and give them extra time. Set weekly time limits, control idle time, set screenshot frequency, screenshot blurring for privacy, and more. Hubstaff's reports allow you to quickly determine how much time was worked by each team member. All time tracked through Hubstaff is automatically available and can be filtered to include just the information you need. You can then download the reports or email them to clients.